I’ve always found Black Dogs to be among the most fascinating of paranormal entities. Their shape-shifting qualities, their fiery, saucer-like eyes, and their propensity to vanish in an exploding ball of fire seem to embody the best and most satisfyingly spectacular qualities found in the menagerie of the supernatural. I would like to say that the stories you are about to read are about Black Dogs. But, while they share some characteristics of that species, frankly, I am not sure exactly what we’re dealing with here. It may be worth putting on record, in these days of vanishing folk-tales, that in my youth in North Antrim such tales as Mr. Drew’s were often told. There was, however, this difference, that the strange creature seen in certain carefully avoided spots was not, like the Cornish monster, passing on its way, but rolling in agony on the ground. I recall one field off the high road to Coleraine, which certainly contained something sinister, for our horses could never pass it without shying, and we were generally driven by a roundabout way to avoid it. I have often, when riding alone, seen my horses’ ears pricked, and known him to shy, when I, despising the terrors of Irish servants, rode past the haunted field. Every horse in the stable, whether drawing a heavy load or light cart, was equally terrified, and more than once I have known them to bolt. The account we were always given was that they could see by daylight what men could only see by night, namely, a great, rough, dark animal with burning eyes, rolling over and over on the grass. It was believe to be a soul in torment, but I never heard any legend as to why that small and uninteresting field was the scene of its agony. One might fancy that horses, being very sensitive as to the presence of a dead member of their own species, may have been conscious of one buried there. But as the same signs of distress were shown by all our horses, and those of our neighbours, for many years, this explanation does not fit the case. I may add that the date of these appearances was in the seventies, and that people now living can vouch for them. Notes and Queries 11 July 1908: p. 35. 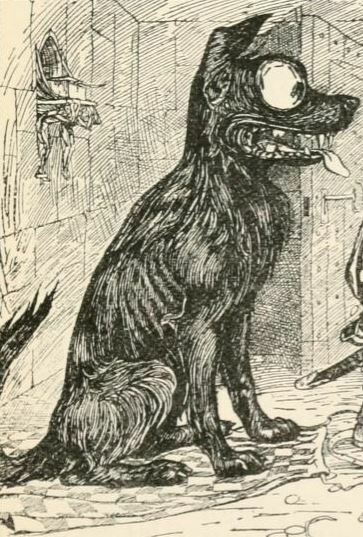 Mr. Drew was the Methodist clergyman and metaphysician Samuel Drew, and the “Cornish monster,” he described was a very conventional Black Dog, although it cleverly disguised its padding footsteps as the sound of hooves. You’ll find his description in The Life, Character, and Literary Labours of Samuel Drew, by his eldest son, Jacob Halls Drew, 1834, pp. 36-9 or Dr Beachcombing has written about Drew’s Cornish Bear Monster here. There is also some interesting speculation in the comments about what Samuel Drew might have seen. Yet, even though a reader of Notes and Queries linked them, how closely do the North Antrim apparitions really match Drew’s account? Drew said that the monster had huge fiery eyes and a dark, shaggy coat. The descriptions of the North Antrim beast are similar, yet vague: a “great, rough, dark animal,” (with fiery eyes) and a “great animal.” It sounds as though the two women had a fair amount of time to observe the tormented Thing writhing about in the field–why did they give no better description? Then there is the repetition of the word “rolled” in both accounts. This suggested to my mind the bulky slug-like creature seen wallowing across the road at Loch Ness, but also the motion of some spook lights and especially of the bizarre rolling wool boggarts of the British Isles. Wandering even further afield in Fortean fancy, the fiery heat that the women felt as the beast rolled over the dyke evokes the ghost of a fire-breathing dragon. Does North Antrim have any worm traditions? Black Dogs are sometimes classed as a kind of fairy or boggart. Are the tortured creatures yet another manifestation of these protean spirits? The fanciful Elliott O’Donnell might have called the beasts elementals. The women associated them with lost souls past praying for and aflame in a perpetual Purgatory.